Your one-stop resource for always-updated cover photo dimensions (and templates) for Facebook, Google+, Twitter, LinkedIn and YouTube. Social media is becoming more and more visual every day. Ever since Facebook revealed its timeline cover photo, people have really taken to it this idea of a large header and/or cover images. It’s a lot of work though to create a good cover photo for your profile– especially when the dimensions for these cover photos are so hard to find. Well, you’re in luck! I’ve gathered the cover photo dimensions from the top five social networks that incorporate them, and put them all in one place for you. I also promise to always stay on top of social network changes, and update these templates accordingly. Download all 5 templates instantly by adding your email below and clicking Download! Now I could take each one of these and break down the specific coverage area, optimal placement (like I did before) and mark out all the different guidelines to best utilize the space on each one. But I realized that the people who would actually use all that info are the ones who could just as easily do it themselves (graphic designers). So, I’m just going to keep it simple, light, and effective. Cool? Cool. One thing I tell all my clients when crafting these for them is that they should not look at it as a billboard or a marketing opportunity. It should be used to showcase the person or brand– not to sell something. It is a means of visually enriching your online story. Too much text is unattractive and people won’t read it anyways. Trying to communicate too much ends up communicating nothing at all. So keep your cover photos high-quality and simple. Lastly, I always recommend that you keep your cover photos consistent across all your social profiles. They don’t have to be the exact same photo, but consistency builds brand recognition and trust. Just something to keep in mind. Coming in at a whopping 1,904,400px of real estate, the Google+ cover photo is the second biggest (next to YouTube). In Google’s newest profile layout, you have 1,840px wide and 1,035px tall to display a beautiful image that showcases who you are. Make good use of it. The new Google+ profile cover design also has a parallax effect that renders most of your image hidden until a user scrolls up to reveal the entire photo. The brightest red area in the (just above) center is where you want to place your focal point. Google+ also preserves the highest image quality of any other networks. So make sure it’s a great image! Twitter refers to this as a Header and allows an image size of 1,500px wide and 500px tall covers up a good portion of the center with the user’s profile photo and bio. So I’ve again added some darker color boxes in this template to show where the profile image will cover up a small portion of the header image. Previously, Twitter would take a larger image and scale it down, making resolution and image quality minor. Now, it seems that Twitter compromises the image quality a great deal. So be sure you’re using the highest resolution version possible. Probably the most awkward of the cover photos (sorry YouTube), this will cover about 1,546px wide by 423px tall when viewed inside YouTube. However when displayed fully on a television it will cover a massive 2,560px wide by 1440px tall (or a total of 3,686,400px). It’s optimized to be horizontal and centered so make sure your primary focus is dead center. I’ve darkened the areas in the template that aren’t show in normal YouTube display. Following Twitter’s lead, LinkedIn unveiled their own feature that allows you to make your profile stand out. Aside from other various aesthetic changes, members can add a cover photo at 1,400px wide by 425px tall which gives you a grand total of 595,000px of visual real estate. Oh, but wait, make sure you take note of the giant area that your profile image and details take up in the center of the image. While this gives a somewhat 3-D feel to the page, it does make designing these covers a bit awkward. To make matters worse, it seems they cut off about 28px at the top and a 21px slice at the bottom (with no clear reason why). If that weren’t bad enough, the scale of the image changes depending on the screen size so if you’re trying to put some sort of message on it– good luck. Big thanks to +Mike Allton from The Social Media Hat for this one. Coming in as the smallest of the social media covers, your Timeline cover photo is limited to 828px wide by 315px tall (for a grand total of 260,820px). With the new 2016 Facebook page layout, cover photos are no longer subject to user interface elements covering up the image in any way. This means you can properly use the full canvas without worrying if anything is going to get covered up. In case you need a quick reference guide, I’ve put this simple infographic together so you can get all these dimensions at a glance. Simple, lite, effective, and highly sharable. Copy the code below and paste it into your website! You can save each one of the photos above and use them at your leisure. Of course proper credit is appreciated, but not required. Make your cover photos beautiful, be creative, and always have fun. What are some of the best cover photos you’ve seen online? You can leave a comment by clicking here. Nice resource, I’m a little surprised that you don’t have instagram in the pack though. I’ve noticed more and more companies moving on to the platform.Will you be adding it in the future? Hi, Murrough! Instagram doesn’t have a “cover photo” (only profile photos and, well… posted photos) so until they do there’s nothing for me to add to this particular resource about Instagram. That means you create custom graphic covers for their Twitter and FB accounts. Check out “social identities” to get an idea! Thanks Dustin. Been wanting to update my Facebook cover for a while so thank you for the great insights. Will promote this article to my social sites for sure! Awesome Rob! Glad you found it useful. Thanks Dustin for sharing this post, It’s helpful indeed. The problem with this is, the social sites used to change these cover picture dimensions and that creates the problems. 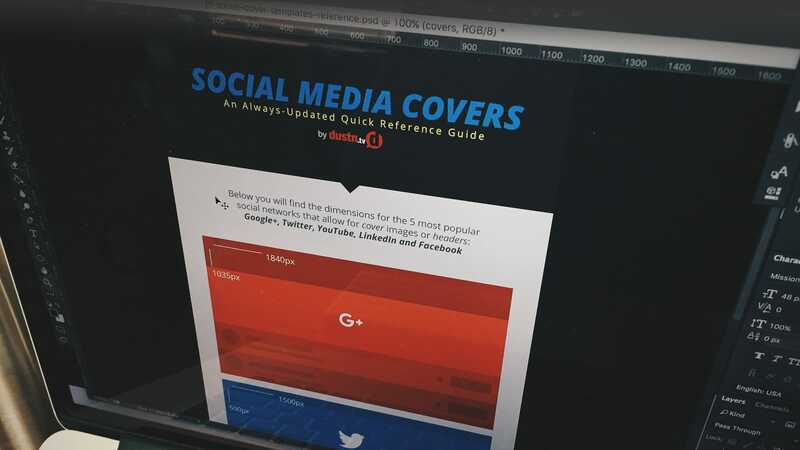 These are great resources for social covers. Thanks for offering them. Thank you so much for this! My brother, Justin, told me about you. One suggestion: could you update the standalone FB template to include the darker boxes that show where the buttons and descriptive text go? I noticed the infographic has those boxes, but the template does not. Hmm… I must have an old file linked. Thanks for letting me know Brandon! Thanks for the very timely and useful post! Pinned, shared ect.. Thanks so much Jinia! Great name BTW! I always had to google for this, I’ll bookmark this one, please update it if any of mentioned site changes their cover photo’s dimension. Like twitter did some time ago. Wow, great article and infographic Dustin! I’ve promoted it on my site with full links back to you – such a useful resource!! Thanks +Dustin W. Stout nice info !!! I may have missed later posts on this topic, but I was updating my own G+ cover last night and the new layout, while the same aspect ratio it would appear, is much different than before. sweet, I really need to think about updating everything, so little time.. thanks for the helpful info. Have you put together (or are aware of) any stats specific to how Google+ appears to handle different sized images in peoples streams, always feel like that is something I should be aware of but lack the time (or more likely talent) to research it. That’s a good question Johnny. I haven’t put anything together like that. Since there’s so many different screen sizes (especially factoring in mobile) that would be a tough one to figure out. Thanks Dustin! It prompted me to update some of my social media covers. Great info on sizes and philosophy behind it. I’m glad you found it so helpful Danny! You are so very clever! How can I chat with you? I have a question about this post. Best way is through my contact page here. You’re welcome! BTW August, have you considered getting a Gravatar?